BETTER THAN READY (AUS) (Bay or Brown 2009-Stud 2015). 8 wins-1 at 2-to 1200m, $484,875, ATC Brian Crowley S., L, BRC Falvelon H., L, Mick Dittman P., L, Keith Noud H., L, Darley Australia H., Club Super H., Ramsay Health Care 2YO H., 3d BRC BTC Cup, Gr.1, 4th MRC Rubiton S., Gr.2, BRC Hampden S., L. Out of a half-sister to SW Publishing (VRC Standish H., Gr.3) and SW Miss Mooney Mooney. Sire of The Odyssey, Betaima and of the placegetters Arnwood, Ready's Girl, etc. His oldest progeny are 2YOs. The Odyssey (c. by Better Than Ready). Winner. See below. Force Nine. 7 wins from 1600m to 3200m, NZ$3,675, A$115,520, VRC White Hills H., MRC High Syce H., 2d MVRC Renown Silverware H., MRC Prince Salieri H., 3d VRC Hilton Nicholas H., MRC Hyperno H.
Pelagic. 2 wins at 1400m, 1600m, Avondale JC Jan's TAB Ponsonby H., 2d ARC Lion Red H., 3d ARC Dunstan Feeds Qualifier, Speights 2YO H., BOP RC First Sovereign Trust H.
Rentabar. 2 wins-1 at 2-at 1100m, 1600m in Aust. Sherbrooke. 2 wins at 1200m, 1300m in Aust. BERLIOZ (Sri Pekan). 4 wins at 1400m, 1600m in India, Indian Two Thousand Guineas, L, Mysore Million, L, 2d Mumbai Maharaja Jiwajirao Scindia Trophy, L, Bangalore Two Thousand Guineas, L, Mysore Derby, L, 3d Mysore Two Thousand Guineas, L, Chennai Super Mile, L.
Aquadisiac (Storm Trooper). 4 wins from 1400m to 2000m in India, 3d Pune Idar Gold Cup, L.
Cavaradosi (Indictment). 3 wins at 1400m, 2400m in India, 3d Hyderabad Stayers' Cup, L.
Bravissima (Placerville). 2 wins at 1200m, 1400m in India, 3d Mumbai Indian Two Thousand Guineas, L, Indian Oaks, L, Eclipse Stakes of India, L, Indian One Thousand Guineas, L. Producer. STORMY BUT CRAFTY (Storm and a Half). 5 wins-2 at 2-to 6f, Oaklawn Park Rainbow S., L, Louisiana Downs Razorback Futurity, L, 3d Louisiana Downs King's Court S., L, 4th Lone Star Park Alysheba S., L, Louisiana Downs Airline S., L.
Storm Chaser (Storm and a Half). Winner at 2, 3d Louisiana Downs Razorback Futurity, L.
Free Option (Indian Ridge). 9 wins from 7f to 1¼m, Newbury Pricewaterhouse Coopers H., Newmarket Melbourn H., Kempton The Mail On Sunday Mile H., 2d Kempton Kempton for Weddings H., 3d York Hambleton S., L, Newmarket Joe Jennings Bookmakers H., Doncaster Book Online H., Arksey H., Haydock Newstead Properties H.
Top Slice (Trading Range). 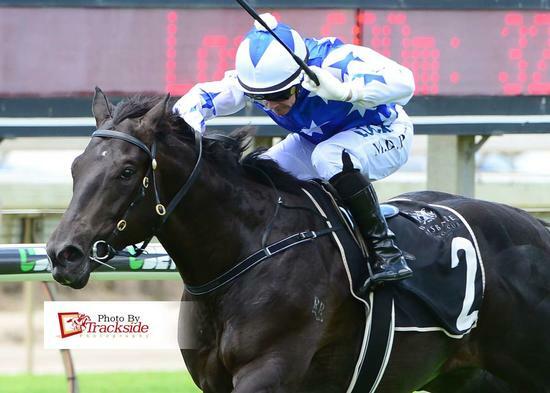 6 wins-3 at 2-to 1100m, A$160,665, MVRC Singapore Raffles Challenge H., VATC Jayco Caravans H., STC Members 2YO H., 2d AJC Moet & Chandon P., Campbelltown City Welter H., R&T Newcastle Distributors H., Silver Saddle Brasserie H., Citius H., Macarthur H., STC Westmead Childrens Hospital P., 3d City Tatt's RC Lightning H., L, STC Sothertons Chartered Accountants 2YO H.
Bull Market (Trading Range). 2 wins-1 at 2-at 1000m, 1100m, AJC WN Parry-Okeden 2YO H., 3d Gosford Slipper, L, AJC PH Osborne 2YO H., STC John Bennett H. Sire. Teheran-Super Century (H.K.). 5 wins-3 at 2-at 1200m, 1650m, NZ$23,750, HK$2,197,000, Cambridge JC Prince Albert Juvenile H., Avondale JC Cabella Construction Juvenile H., Hawkes Bay Beds Beds Bedz Juvenile H., HKJC Mount Butler H., Penninsula Golden Jubille Challenge Cup, 2d HKJC Causeway Bay H., Hoi Yuen H., 3d HKJC So Kon Po H., Luk Keng H., Happy Valley H., Mount Parker H., Jardine's Lookout H.
Louisville Dancer. 4 wins to 1400m, A$138,592, MVRC Christmas at the Valley H., VRC Riverside H., 3d MRC Ken Sturt H., Settlement Hotel H., Oasis H., Le Pines Funerals H.
Race Record: 2 Starts 1-1-0 A$88,550. Winner at 2, A$88,550, in 2018-19, BRC St Rita's College 2YO H., 2d BRC Cory Johnston 50th Anniversary 2YO S.